There are many ways to try to forecast the future level of the stock market – at least one for every ten articles you could write about it. But almost all these methods of making stock market predictions are useless. At worse they’re downright dangerous, because bogus predictions can scare you out of your investments. There’s no shortage of pundits in a bear market to tell you that government debt is rising or global growth is slowing, and to suggest that only a nincompoop would buy shares. Far more then you’ll hear discussing whether an asset class looks cheap compared to earnings or its average valuation. The same is true in bullish times. All the economic data looks good, so most pundits say shares are worth buying – seemingly oblivious to equities’ priced-for-perfection rating or the economic cycle. But don’t take my word for it that making stock market predictions is best done by Gypsy Rose in a tent at a fairground. Vanguard has provided some proof. Vanguard’s data was outlined in its recent report: Forecasting stock returns: What signals matter, and what do they say now? The passive investor’s champion considered a slew of ways we can supposedly predict future stock market returns. 1. P/E1, which uses trailing 1-year earnings. 2. P/E10, which uses trailing 10-year earnings (this is Shiller’s cyclically adjusted P/E, or “CAPE”). 3. Trailing 1-year dividend yield. 4. Trend of real corporate earnings growth (trailing 10-year average real earnings, or “E10”). 5. “Consensus” expected real earnings growth (proxied by trailing 3-year average growth rate). 6. Trend of U.S. real GDP growth (trailing 10-year average growth rate). 7. “Consensus” expected real GDP growth (proxied by trailing 3-year average growth rate). 8. Yield of the 10-year U.S. Treasury note (reflects inflation expectations and anticipated Fed policy). 11. Fed Model: the spread between U.S. stock earnings yield and the long-term government bond yield (the spread between the inverse of P/E1 and the level of the 10-year Treasury yield). 12. Building-block model with trend growth (a combination of 3 and 4 above). 13. Building-block model with consensus growth (a combination of 3 and 5 above). Vanguard’s researchers fed each of these into their regression analysis to come up with a measure of ‘predictability’ for each variable, versus the actual real return from the US stock market. The regression is designed to estimate to what extent the dividend yield on the U.S. stock market in year “t” has explained the variability of the rolling 10-year real return for the years t+1 through t+10. In this way, the regression is specified so that an investor would not have to guess at the future of the independent signal (here, the dividend yield) in order to alter her forecast for stock returns over the next ten years. In this sense, the regression is estimated “in real time,” although the statistics we report are in-sample results, meaning that we measure each variable’s predictive ability over the entire data set. Vanguard measured such predictability over one-year-ahead and 10-year-ahead horizons. It used data going back to 1926 to see how closely each variable predicted the future level of stock market. The science bit: Vanguard’s ‘regression framework’ shows the degree of correlation between the potential return predictors and the actual subsequent stock returns. An R-squared near 0 would imply that those metrics have little to no correlation with future stock returns; that is, the metrics are essentially useless as predictors. 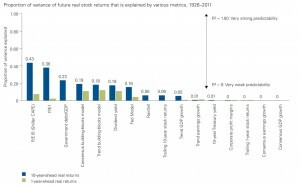 An R-squared near 1.00 would imply that those metrics correlate almost perfectly with future stock returns. What did Vanguard’s researchers find? Vanguard’s boffins reported back that most of the variables they studied were about as helpful as asking your dog for one bark or two to tell you whether the market was headed up or down. This graph is just incredible to me, even as a committed skeptic about the value of pundits pontificating about the economic outlook and so forth – at least when it comes to stock market returns. Remember, the R-squared figure shows how strong the predictability of any particular variable proved over the one and 10-year forward periods. And most of the variables showed the predictive power of an 8-ball! Look at corporate profit margins, for example. How many times have you heard somebody state that “profit margins are too high, and so the market must come down” in the past year? Yet corporate profit margins were found to have ZERO predictive potency. That’s even worse than guessing future returns from the level of US rainfall! It’s also telling that GDP growth – another statistic beloved of financial talking heads – had virtually no ability to predict future returns from shares. The only half-decent indicator was the P/E ratio, with the cyclically-adjusted P/E 10 measure doing a marginally better job of forecasting returns then the standard P/E measure. But even this was pretty weak, only explaining about 40% of the future return on a 10-year basis. As for the short-term, the grey bars show that no measure was much cop at predicting next year’s stock market return. That’s even worse then I’d have expected. If you’d put me on the spot before I saw this research, I’d have imagined that a low P/E for the market might give some clues on a one-year basis, but in reality the correlation is pitiful. The ten-year figures for P/E are better, as I say. Perhaps this suggests even cheap markets take a while to become more fairly valued. Why do most variables not work? I believe the average person looks at the stock market and the news headlines and makes a huge error of omission. They forget that hundreds of thousands of people – and vastly more computers – are seeing exactly the same information. In my opinion, that is the main reason why most of these prediction methods are useless. If you see the BBC reporting that UK GDP is going to fall next year, for example, then you can bet that the signs of a slowdown have been coming for months. By the time you see Huw Edwards on the Six O’Clock News beginning his grim recount, share prices will already have changed to reflect the drop in GDP. And by then it’s probably too late to profit. The same thing also happens in reverse. For example, “everyone knows” some particular emerging market will grow strongly over the next decade, but an investment there proves mediocre over that time frame because it was already priced in at the start. A further probable reason for the failure of these indicators is that their supposed utility is widely known. “Quants” and algorithmic traders have crunched this data to death before you’ve even crunched your morning cornflakes. Good luck seeing something before them! Why can price/earnings successfully predict, a bit? This still doesn’t explain why P/E seems to at least partly predict future returns from the stock market, however. After all, the price to earnings ratio and the notion of buying cheap are hardly the world’s best-kept secrets. I think there are a few reasons why P/E has worked much better – though far from well – as a predictor, compared to other variables. Combining the two gives us a direct measure of value. Looking at earnings over a ten-year basis (i.e. PE10) potentially smooths out some of the peaks and troughs. This is in contrast to say the variable “consensus expectations of GDP growth”, which is many levels removed from the value of your investment. Secondly – and crucially – the P/E ratio is inherently contrarian, at least when used as a sort of value Geiger counter, where low P/E is taken to indicate a potential bargain. I said one reason most methods probably fail is because the information is too widely known to everyone in the market. And the same is true of P/E. However, a stock with a high P/E is popularly thought to be more attractive, by definition, than one with a low P/E rating. Investors are prepared to pay more for a high P/E stock’s earnings. Similarly a stock – or a stock market – on a low P/E ratio faces more pessimism about its outlook. Buying at lower P/E ratios – especially at historically extreme lows – therefore tilts you against the prevailing wisdom. The takeaway for me from this study of stock market prediction methods is my usual one – that valuation is what drives future returns, not news headlines. Buying cheap is the best way to generate superior returns from investments. That doesn’t mean buying rubbish, it means paying less than the intrinsic value of whatever asset you’re shopping for. Most market pundits are only important to us in so much as they scare other people out of assets, and so give us more chances to buy cheap. I do concede it might be possible for hedge funds or other sophisticated investors to find new data that better predicts future returns, and to profit from it until that information becomes widely understood. It’s probably also possible to combine existing data in complicated ways to create new valuation methods that may do a better job of predicting returns for a while, or for managing risk. The Vanguard academics have only shown us here that the simple rules of thumb are generally useless for prediction. They haven’t proved it’s impossible. But super analytical number-crunching isn’t a game us ordinary investors can play – and as a group hedge funds have tended to lag the simplest stock/bond ETF portfolios, anyway. So arguably you’re not missing much! Passive investors can once again proceed smug in the knowledge that their method of index tracking provides the best way of ignoring all this irrelevant noise. As for active investors engaged in stock picking, it’s further evidence that if you spend 15 minutes considering the macro economic outlook instead of company fundamentals, you just wasted at least 14 of them. There’s a PDF download on Vanguard’s website of its full study into predicting stock market returns. I’m not sure this is proof of much. A market that is cheap at one point (on either CAPE or divi yield basis) could rush foward, become expensive and then crash again in that timescale. The question is whether a period of good (poor) returns follows cheap ( expensive) valuations using these measures and the answer is yes. Check out the matrices on Ed Easterlings sight or look up the Barclays Equity Gilt study. Holding on to a heavily invested position after a good bull run to measure the 10 year return is rather arbitrary. It would be more useful to see the correlation of returns over a wider range of timescales. Or have a missed something ? 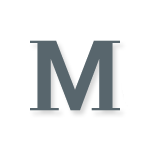 please can we have a new motivating blog from you. As the government hands free money to the robber barons (aka banks) and saving rates plummet, those of us seeking financial independence are having a dip in motivation as FI seemingly recedes away into the future. A reminder that the consumer sacrifices we make today (no iphone or ipad etc) will mean a better future (ie. heating when I’m 80) is sorely needed by my current self. Thank you and Merry Christmas and a great 2013. I saw this research a while ago. It’s okay, but the big flaw is that a 10 year time-horizon is too short. If they use 20 or 30 then PE10, PE20 and PE30 and Tobins Q have pretty good predictive power, although of course a long way from knowing what the market’s level will be in 20 years. But still very useful for asset allocation. Sorry to be a bit negative… your article is of course top notch as usual! Yup, thought insightful article, but being a perveyor of passive funds I can’t help wondering if Vanguard have tilted the survey in their favour because it’s at odds with much of the research I’ve seen. Tweedy Browne’s papers consolidating similar areas of research are a good place to start, also Stockopedia’s strategy backtests. Long run historic data is good for being able to see the wood for the trees; the 2009 Barclays Capital Equity Gilt Study analysing their 110 years of data found that valuation was the most important indicator of future returns. Personally I believe that stock markets are 80% efficient 80% of the time, which gives active investment strategies plenty enough room to outperform. But I’ll be dead before I can prove it, so perhaps I’ll have to set up a perpetual trust. @Daytona — But as I say above, the only thing Vanguard found that worked *was* valuation. It just worked only partially (explaining 40% of returns). So I’d say it’s in agreement up to a point with the Barclays Equity research. ‘fraid not. 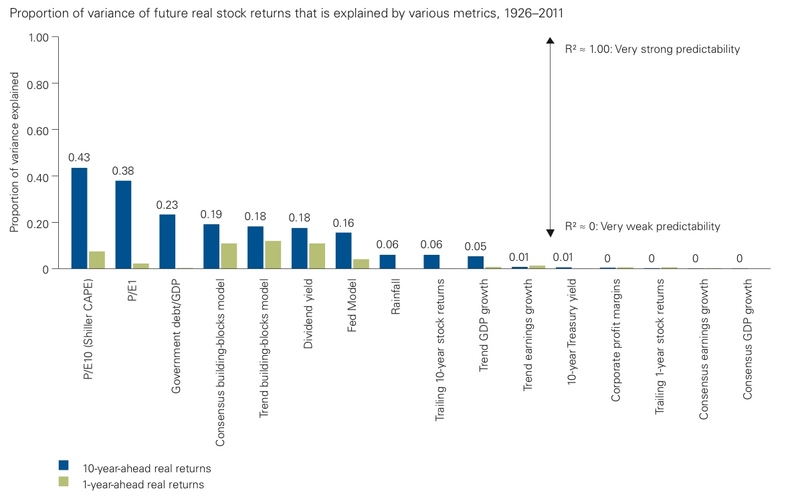 It shows that they correlated almost perfectly with past stock returns. It gives a good reason to hope, even expect, that it will predict future returns but that is as good as it gets. It should not come as a surprise that it is difficult to find a ‘formula’ for stock market success. However, the relatively high explanatory power of the humble p/e ratio – even the 1 year version – gives us maybe some cause for optimism. I note (as an Income Investor) that dividend yield did not register, although there is a fair amount of academic evidence to contrary. Anyway, there are many non-quantifiable factors that most of us use to evaluate a particular share: mine include yield, p/e, debt, cash-flow, business model, management track record, etc. I eliminate more than I choose. In fact most shares fall in value (in the US, some research shows 70%, over 20 years) – if we can eliminate most of those from our portfolio, that would give us a boost! I have a couple problems with the article. First it really on details fundamental analysis of the market and does not give much commentary about how technicians evaluate the market. Second it leaves the time frame of forecasting rather open ended. In smaller time frames the market is fairly predictable if you can stomach the occasional wild swing. By and large bull markets tend to run 6-10 months followed by a correction of some degree. It’s not perfectly cyclical but it is pretty predictable. This is the purpose of my blog: to highlight the current market trend and make commentary on what I perceive the market to do next. People really need to look at technical analysis a lot more. Most technicians will tell you there is big difference between a company and its stock price. They can move independent of each other. The same can be said for fundamental analysis and the stock market.